First, thank you for putting your trust in me and I’d like to honor you for being here. So many people talk about lifestyle changes, yet very few jump on the opportunity to do so. You though are different. And I want to tell you I am inspired by you and I’m truly grateful you’re here. Our Little Black Dress Project Private Facebook Group is where the action happens. You’ll also receive direction and reminder e-mails for each step so please add us to your email white list. This is IMPORTANT! There will also be directions provided periodically in the group by myself and the coaches. I highly recommend you go to the group, introduce yourself and begin getting a feel for it all. Share your goals, your fears and begin connecting with other ladies just like you. I can’t wait to help you and there will be plenty of time to interact once we start. Just a reminder: if you miss anything, all you’ll need to do is to scan the feed within the group or check your email. All videos and other content will be shared in only those two places. If you have any trouble just ask in the group or email support@jacquelinesobotka.com. So, I put together a short intro video that shows you exactly what to do. Visit the group and watch it. Don’t forget to read your emails as they pretty much walk you through the program too. But most importantly, don’t ghost out…ask for help, send us your questions, cries for help or screams of frustration. I’m passionate about seeing you thrive as you build momentum, and I’m excited to help you along the way. 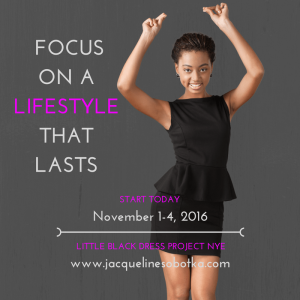 Thank you again for joining The Little Black Dress Project. We are so pleased to have you in our community! Fill Out Our “What You Really Want” Welcome Survey to help us get to know you better.